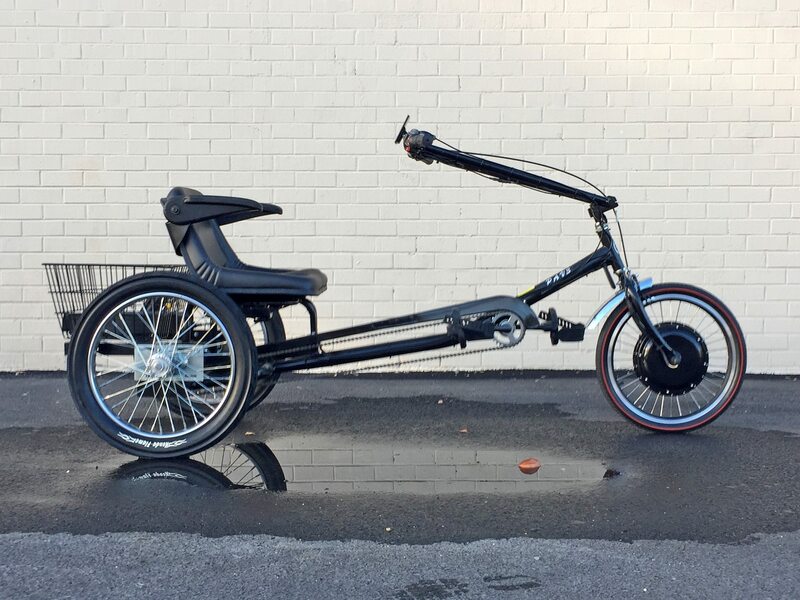 The Personal Activity Vehicle 3 (PAV3) from Worksman Cycles is a tricycle designed for full sized adults and those looking for comfort and cargo hauling ability. 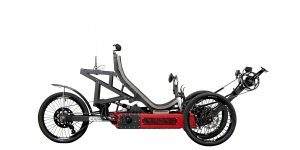 I visited Electric Bike Technologies in Croydon Pennsylvania to check out their electrified version of the Stretch trike which uses a 500 watt gearless hub motor and 48 volt Lithium battery pack from E-BikeKit.com and sold exclusively from ElectricTrike.com. 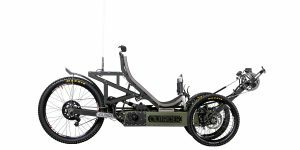 Before I dig in too much, the point of sharing these details is that people who already own the Stretch could get their own motor and battery pack (the same ones shown in the video review) and convert their bike to electric with a bit of effort. For me, the motor really let this trike shine because it’s fairly heavy and only has three gears. It goes from something neat but potentially exhausting or short-ranged to something more useful and dynamic. For people who don’t have a license, this could be a great way to get around and actually haul food or fishing gear. 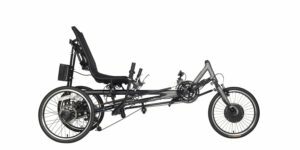 While there are many other tricycles and recumbent trikes out there to explore, this is one of the most solidly built and comfortable. It has super-thick 11 gauge spokes in the rear with three inch wide tires! This is getting into moped and motorcycle hardware territory and that’s what makes it so capable. 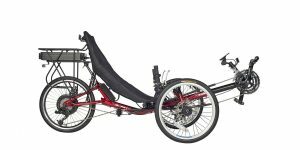 You can load the trike with up to 500 lbs of weight including the passenger. For those who don’t enjoy saddles or might not have as good of balance, the chair with arm rests is a great fit. 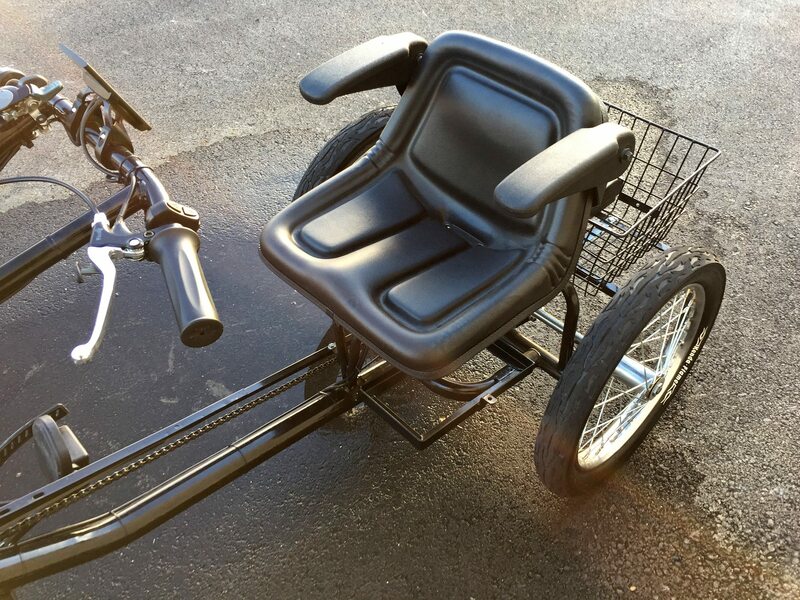 It improves rider stability once seated but since the arms swivel up, it’s not too difficult to get on and off of (though the trike is a bit low). 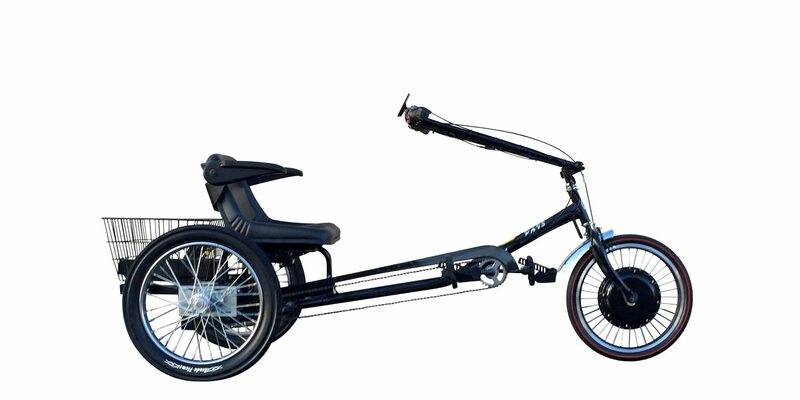 As mentioned earlier, this trike uses a 500 watt nominally rated gearless hub motor mounted in the front wheel. 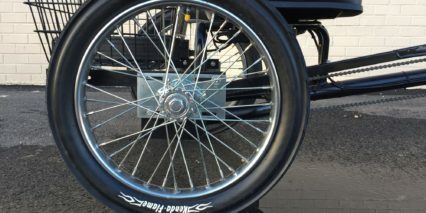 This wheel also uses extra-thick 12 gauge spokes but has a more traditional tire. 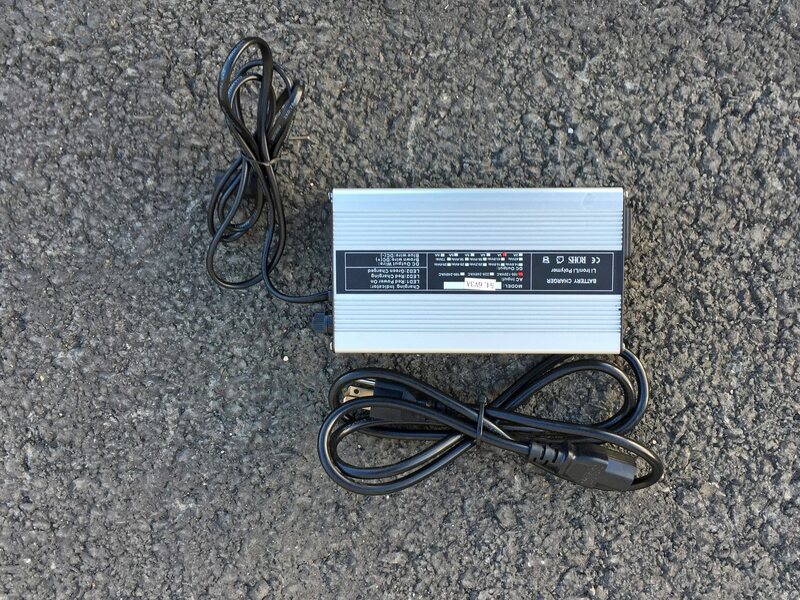 The hub motor is very quiet even when it’s peaking near 1,000 watts in the highest power level. For best results, I’ve found that pedaling a bit at start and when climbing will unleash the full power of the motor. These gearless designs aren’t as torquey but they tend to last longer than gearless. 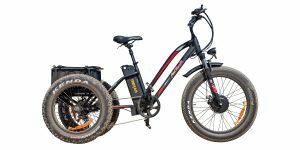 They are a bit heavier and suffer from cogging if the bike is turned off so keep an eye on the battery level and consider taking the charger along in the basket just in case you decide to adventure further. Getting stranded with this thing could be a nightmare given the awkward size and weight. Even loading it in your own car or truck could take some doing and might require a friends help. 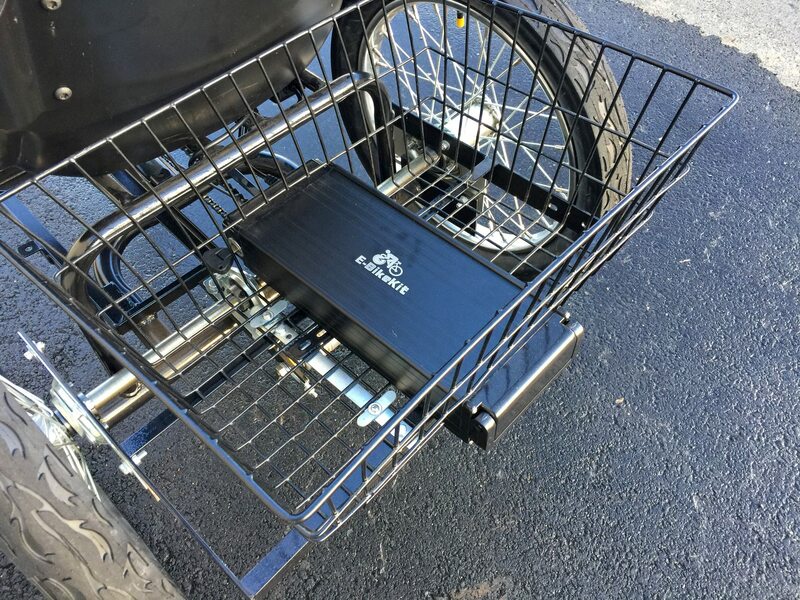 Powering the trike is a large 48 volt 10 amp hour battery with light weight, long lasting Lithium-ion cells. The pack is encased in Aluminum making it tuff which is great because it passes through the rear basket and might get covered up by gear. 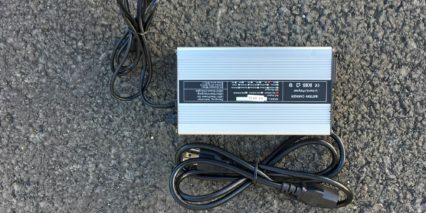 The pack has a handle at the back making it easier to slide off and carry around, just under the handle on the right side is a charger plug and catty-corner on the front left is the ignition slot. Here is where you’ll need to insert and turn the key in order to start the bike. This key must remain in the pack, like a car, when riding and I found that it was a bit tricky to reach between the back rest on the seat and the wire mesh basket. This might be due to the seat position we had set up, the seat does slide forward and back to accommodate people with different leg lengths. 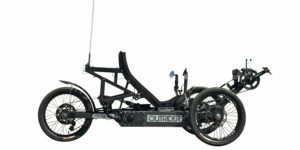 Ultimately, the battery works fine and is covered by the one year comprehensive warranty from ElectricTrike.com. Operating the bike isn’t quite as simple or quick as with more mainstream purpose-built electric bikes but it’s fairly typical. Turn that key then press the “M” button on the control pad near the left grip for a few seconds. The display panel comes to life showing battery capacity, speed, power level and a few other readouts. I love the size and position of the display because it’s very easy to read. You can swivel it forward and back to reduce any glare and at night it can be backlit if you hold the up arrow on the control pad… I might leave it off because it could be distracting. The only gripe I have about the display is that it is not removable. This means it could experience more weathering if left outside, and given the size of this trike that could be fairly common. Thankfully, the battery is removable so at least you can avoid extreme heat and cold (which both degrade the cells more rapidly). 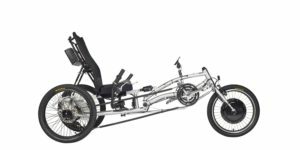 Coming back to the display, as you arrow up and down between level 1 and 5 the trike offers more power and a higher top speed. For those concerned about going too fast, the display lets you set a maximum speed (hold up and down simultaneously for a few seconds to access these settings). Making the trike go is a matter of selecting the power level then twisting the half-grip throttle on the right. Note that the red button mounted to the grip here activates reverse. Some of the older trike kits I’ve reviewed were simpler but less well made. 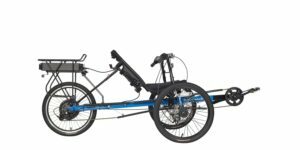 The Worksman Cycles PAV3 isn’t as complicated to use as an automobile but it’s definitely a step up from a regular tricycle. 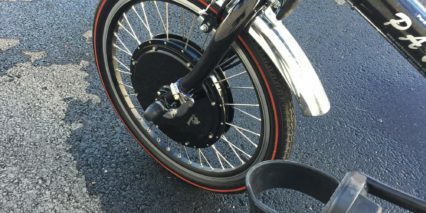 In addition to the motor (which can have throttle and pedal assist modes) there is a three-speed geared hub in the rear for pedaling. 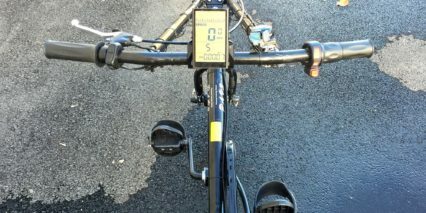 I love this feature because it makes pedaling more comfortable at a range of speeds. Even if you’re not pushing much, it’s nice to move your legs for increased blood flow and flexibility. One concern that some riders might have is foot stability so the added foot-straps are a real bonus. I rarely see this sort of thing and while you could probably figure out an after-market solution, it’s cool to have them from the get-go. 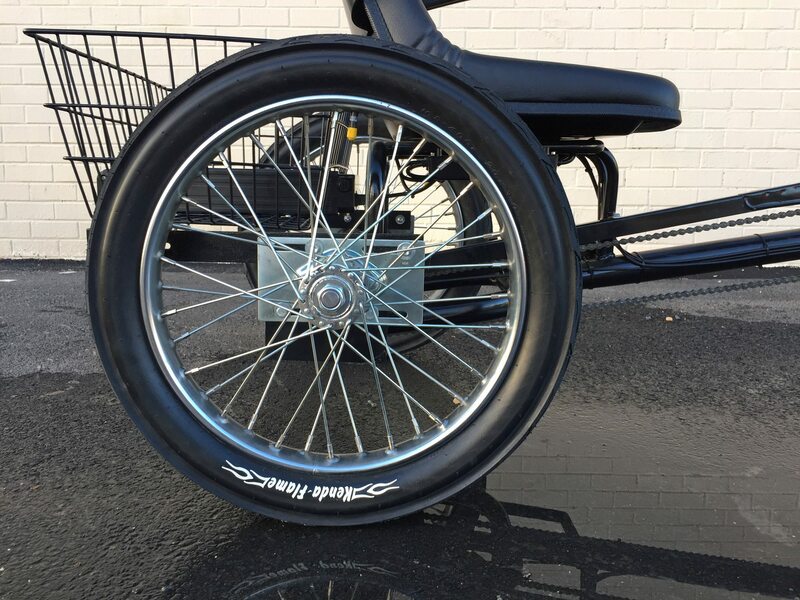 My final thought on this trike is that it uses some basic parts (like the front brake) but has a solid motor system and offers a very approachable ride. 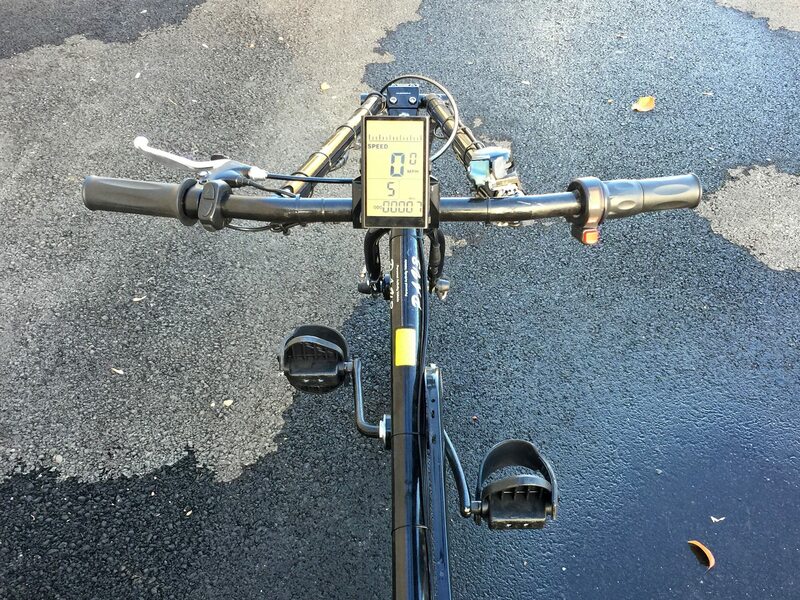 It’s stable, easy to mount and fun to pedal without being dangerous… especially with the lower speeds. 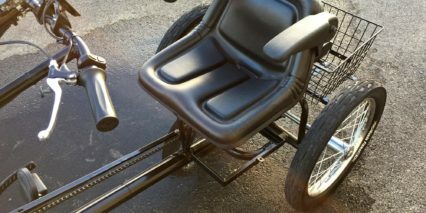 This trike isn’t as likely to tip from side to side because the seat is mounted low and towards the back where the two wheels are. Even the steering, which brings the bars way back to you vs. making you lean forward to reach them, is comfortable but also safe. Turning sharp is difficult without putting your arms way out from side to side. Your turning radius is reduced but the propensity to tip is significantly reduced. This is a niche electric trike to be sure but I think it’s amazing and potentially very empowering. Not only does it make cycling possible for people who weigh more or aren’t as balanced and stable, it can get shipped directly to you door ready to ride without assembly and it’s made in America… from the frame and assembly of electronics to support and shipping this is a bike that’s produced on the East Coast. Some of the battery and motor technology come from Asia but compared to many other products, this is a much more local product and the team is very cool. 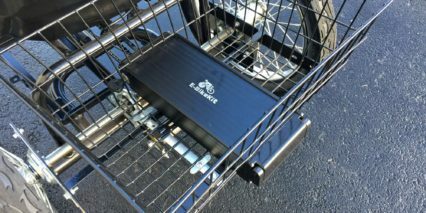 Big thanks to ElectricTrike.com for partnering with me for this review. 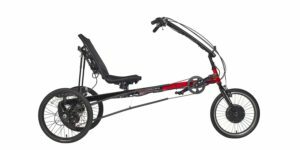 I’ve decided to purchase and electric assist trike and your reviews have been most helpful searching out the right machine for me!! Thanks Much. Having narrowed down my choice to either the Worksman PAV or Sunsetter’s EZ-3, I’m a little confused as to the placement of the hub drives. 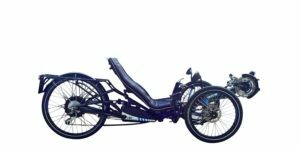 It seems to me that instead of placing it on the front wheel the makers of these trikes would opt for using the free wheeling rear wheel. Front wheels tend to be smaller, narrower and have a tendency to slip. Why don’t they use the rear left wheel or is there something I’ve overlooked? Hi Joe! Glad to hear that this resource has helped you! 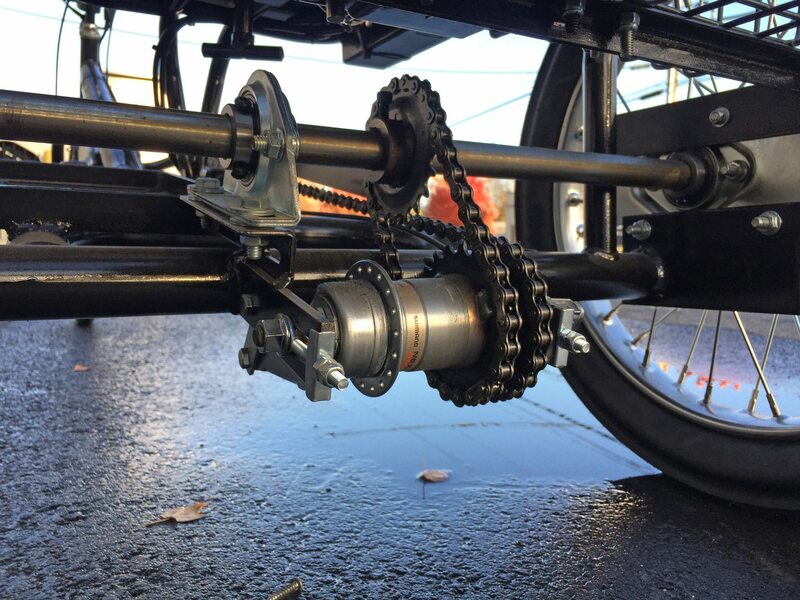 I think it’s difficult to combine an axle mounted hub motor with trikes because they don’t usually have dropouts on the rear wheels, just a single axle jutting out to either side. 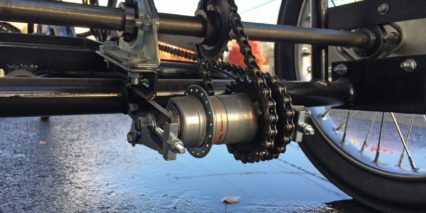 Since the axle on a hub motor is mounted to the motor itself (the primary sun gear) and is not built around a thru-axle, you’d need to weld the threaded axle that is already attached to the motor to the bike frame in order to achieve the same end result and give it something to “push” against… or have two-sided dropouts on both rear sides of the trike vs. just the fork, which would add cost and weight to the trike. This would be my guess, it’s just simpler to use a front mounted motor, even though it slips a bit and impacts steering. 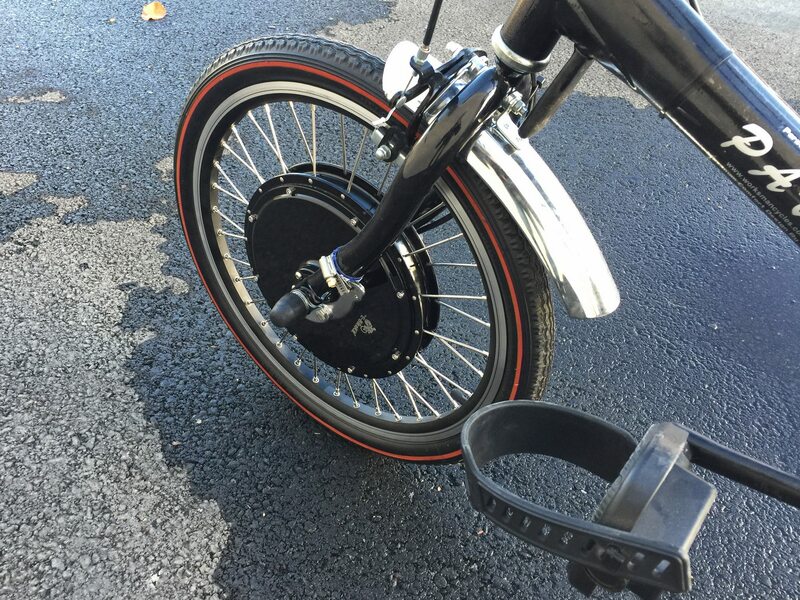 Some mid-drive trikes do power a single rear wheel by powering the main drivetrain (the gearing that you pedal) but this has the consequence of turning a single wheel (usually the left as you pointed out). Here’s an example of that in action. I hope this helps! 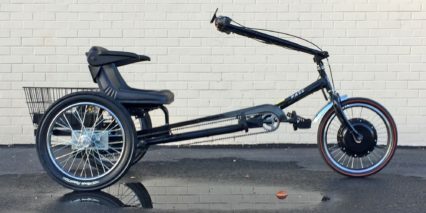 Is the Worksman Cycles PAV3 Stretch electric trike unit still being made? I was looking last year and I’m ready to buy. I don’t see on the website. Still sold on the Worksman website here as of April 2018.